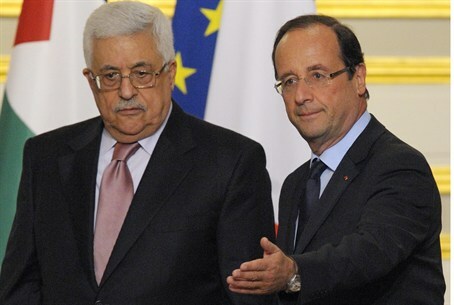 PA Chairman Mahmoud Abbas in France: We may seek non-member status at the United Nations if peace talks with Israel do not resume. Palestinian Authority Chairman Mahmoud Abbas warned on Friday that he may seek non-member status for a Palestinian state at the United Nations if peace talks with Israel do not resume, The Associated Press reported. He added, according to AP, “Of course, we are going to encounter many obstacles.” He did not specify when he might take his bid to the General Assembly. The UN Security Council blocked Abbas’ bid to become a full member last September, after he failed to get the required support of nine of the Security Council’s 15 members. The previous 10-month construction freeze in the 'disputed territories' by Israel was not only rebuffed, but met with the failed statehood bid at the UN. Peace talks between Israel and the PA have been frozen since Jordan hosted a series of “exploratory meetings” between PA and Israeli representatives several months ago. The PA refused to continue to talk after those meetings and threatened to cancel all agreements signed after 2000 if Israel does not agree to all its preconditions before peace talks. Netanyahu, meanwhile, said last week he believes his 94-seat super-coalition is a historic opportunity – and mandate – for peace. "Let me clarify – I have not set any conditions to enter into negotiations," he said, repeating his willingness to begin negotiations immediately. "Certainly I will have conditions to conclude negotiations, and so will Mahmoud Abbas. This is natural and it is the reason we conduct negotiations. But this is why I say to Abbas – don't miss out on this opportunity to extend your hand in peace."